Polish death metal masters DECAPITATED have released an official video for their new track "Veins". The unique animated video was created by Polish based animator/concept artist Lukasz Rusinek and depicts an apocalyptic universe featuring droids and feuding superpowers. Watch the video exclusively over on the band's website HERE. Lukasz commented on the video: "Animation is an area extremely time-consuming and the fact that I work alone only adds to the sad fact that, especially during complex productions such as the video for the song "Veins" by DECAPITATED, my little ones await their father to come back home in the evenings in vain and my newlywed wife withers at the window longing to see me. Despite these minor inconveniences, I do not complain because I love to combine sound with vision. On most occasions I prepare scripts myself. And so it was this time. I came up with a short story with the apocalypse in the background, set in a slightly imaginary universe in which droids fight on battlefields instead of humans, intelligence cells of feuding superpowers plot their rise to power, and the relics of the Cold War keep waiting for someone to finally press that 'damn button'. Enjoy." The video is being released in support of the DECAPITATED's forthcoming tour dates across the US, EU and UK. Speaking about their international dates, the band commented: " We can't wait to start the touring ahead - we're in America, Canada, UK and Europe with some great bands and look forward to playing in front of our loyal DECAPITATED fans across the world!”. DECAPITATED's latest album, Blood Mantra, was recorded under the direction of Wojtek and Slawek Wiesawski at Hertz Studio in Poland. 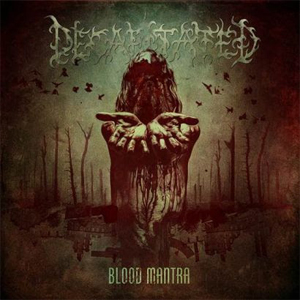 Blood Mantra features the debut of new drummer Michal Lysejko.